Experts believe that this initiative of the human rights activists will hardly be put into practice. While the prosecutor’s inspections of Russian non-governmental organizations (NGOs) continue and some of them are already facing a shutdown, Chairman of the Russian Presidential Council for Civil Society and Human Rights Mikhail Fedotov offered a cardinal reform of the legislation on the NGOs. Actually he proposed to abolish the law on the NGOs, which caused massive inspections of public organizations, the Kommersant daily reported on Monday. However, the experts believe that this initiative of the human rights activists will hardly be put into practice. Some of them name it naive straightforwardly. “We insist that the non-commercial sector should be regulated by the Civil Code, which outlines all the requirements for the operation of public and human rights organizations,” Kommersant cited Fedotov as saying. The members of the Presidential Council for Civil Society and Human Rights have been discussing a possible drastic amending of the law on the NGOs already for a week, but before this the question was not raised in such a radical manner. “Approximately five different scenarios of amendments are being debated,” Fedotov noted. “This is the only opportunity not to augment the number of amendments, but just to clean the legislation from unnecessary junk,” one of the initiators of the idea to cancel the law on the NGOs, member of the council Pavel Chikov said. “The Civil Code is a document, which possesses a priority over the specific legislation in legal terms. If the law on the NGOs is abolished, the Civil Code will retain the basic provisions, which regulate the activities of the non-commercial sector, and all excessive provisions, which had been introduced recently, particularly the provisions on extremism, foreign agents and political activities, will be removed by themselves,” Chikov explained. Senior lawyer of the law firm “Yegorov, Puginsky, Afanasyev and Partners” Maxim Rasputin named the initiative of the Presidential Council for Human Rights “naive”. “The Civil Code sets common requirements for the NGOs and nothing more. The specific law is more correct, as it sets more detailed rules, including over the administrative issues, which are out of place in the Civil Code,” Rasputin said. 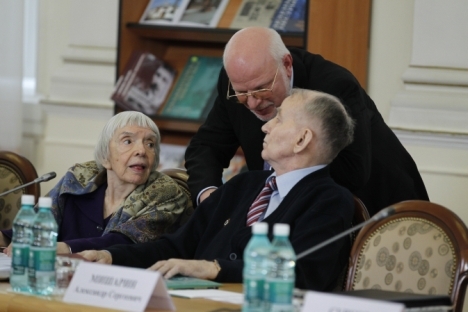 President of the Institute of National Strategy Mikhail Remizov also does not see any chances to translate into life the initiative of the Presidential Council for Civil Society and Human Rights. “Fedotov’s task is to save face in the eyes of the liberal public, as much criticism had recently been voiced against him, because he had taken unpopular decisions in the liberal community,” the political expert told Itar-Tass. “The state authorities do not like to act under pressure,” the expert noted. If they made up their mind to soften the legislation on the NGOs, they “would have done everything the other way round,” Remizov believes. So, the political expert believes that the chances are not high that the initiative of the human rights activists will be approved. According to the law on the NGOs, which was enacted in November 2012, a Russian non-governmental organization, which receives funding from abroad and is involved in the political activities at the same time, is granted with the status of “foreign agent” and should be registered in the special register. This non-profit organization is put under a much tougher financial control and other types of control by the state authorities. The non-fulfilment of the requirements of the law is punished with large fines and even imprisonment. Massive inspections of the NGOs, including local organizations as well as Russian branches of the international structures have been conducted in Russia since March 21. In this respect, the international human rights organizations and the state officials of several Western countries demanded that the Russian state authorities should explain the situation and stop, as they claimed, the pressure on the NGOs. Russian President Vladimir Putin stated back at the end of March that the inspections of the NGOs are scheduled and are aimed to find whether their actions comply with the Russian laws. “The Prosecutor General’s Office is to check the lawfulness of the actions of all state authorities, regional, municipal and public organizations. I believe that in this case the aim of all inspections is to check whether the activities of some non-governmental organizations correspond to the tasks set before and whether their activities comply with the laws of the Russian Federation,” Putin said. The inspection of the NGOs is particularly aimed to expose extremism-related organizations, spokesperson for the Prosecutor General’s Office Marina Gridneva explained then. The inspections have already brought the first results. In mid-April the criminal case was opened in Kostroma against the Kostroma centre for the support to the public initiatives and its executive director Alexander Zamaryanov. The centre was suspected of violation of the rules for the activities of a non-profit organization, which performs the functions of a foreign agent. The fund is suspected of the actions as a foreign agent, as it receives the monetary funds from abroad and at the same time it is involved in the shaping of the public opinion about the state policy in Russia. The organization is facing a fine of up to 500,000 roubles, Zamaryanov - a fine of up to 300,000 roubles. The Justice Ministry has earlier submitted in the court the documents over violation of the registration by the non-governmental organization Golos. The Justice Ministry explained that Golos is funded from abroad, but the organization was not registered as a foreign agent yet that means that it breached the law. None of non-governmental organizations acting in Russia has been registered as a foreign agent yet. Two non-governmental organizations, who wanted to take this step, namely Shchit i Mech (shield and sword) and the historical fund of Alexander the Third (the Russian emperor in the second half of the nineteenth century - Itar-Tass) were denied registration.